Mather is the best place to camp in Grand Canyon National Park, if you can get a spot. During the busy season of March 1 to November 30 all sites are reservation only, and sites can be reserved up to six months in advance. This is a major advantage to those who can plan ahead, but last-minute campers will have to try their luck at the more rustic and peripherally located first-come, first-served sites at Desert View Campground. 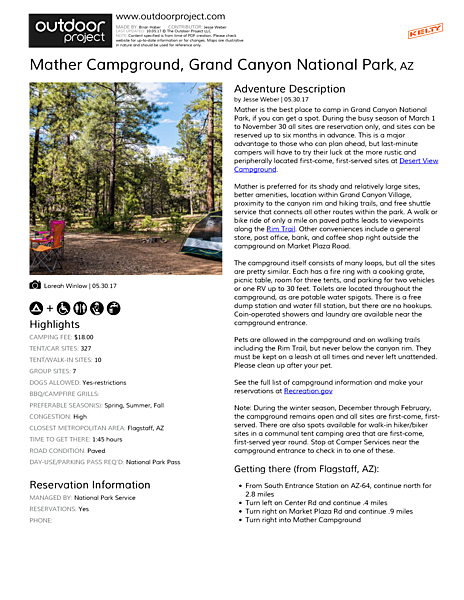 Mather is preferred for its shady and relatively large sites, better amenities, location within Grand Canyon Village, proximity to the canyon rim and hiking trails, and free shuttle service that connects all other routes within the park. 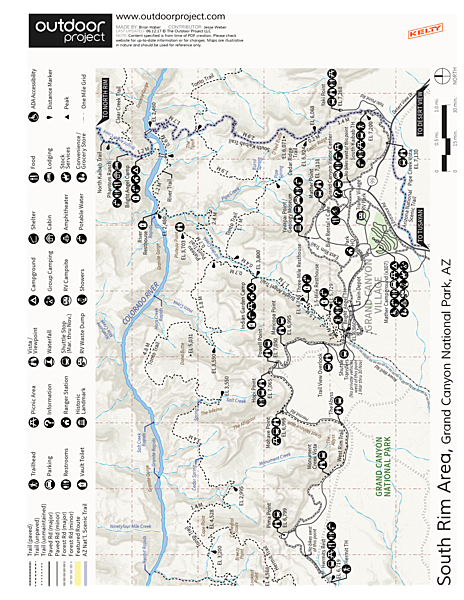 A walk or bike ride of only a mile on paved paths leads to viewpoints along the Rim Trail. Other conveniences include a general store, post office, bank, and coffee shop right outside the campground on Market Plaza Road. The campground itself consists of many loops, but all the sites are pretty similar. Each has a fire ring with a cooking grate, picnic table, room for three tents, and parking for two vehicles or one RV up to 30 feet. Toilets are located throughout the campground, as are potable water spigots. There is a free dump station and water fill station, but there are no hookups. Coin-operated showers and laundry are available near the campground entrance. Pets are allowed in the campground and on walking trails including the Rim Trail, but never below the canyon rim. They must be kept on a leash at all times and never left unattended. Please clean up after your pet. Note: During the winter season, December through February, the campground remains open and all sites are first-come, first-served. There are also spots available for walk-in hiker/biker sites in a communal tent camping area that are first-come, first-served year round. Stop at Camper Services near the campground entrance to check in to one of these. Shady and relatively large sites. Good amenities. Close to the visitor center and canyon rim. Reservation only. Must reserve far in advance.